Gum disease is an infection of your gum tissue that holds your teeth in place. Its early stages are reversible but if left untreated, it can lead to bone and tooth loss. Plaque buildup that turns into tartar forms at the gumline and causes your gum tissue to separate from your teeth. If you notice any of these symptoms, talk to your dentist in Kaukauna as soon as possible to treat the issue before it becomes more severe. The most common way gum disease is treated is called scaling and root planing. Your dentist will clean along and below your gumline and smooth out your tooth’s root, allowing your gum tissue to reattach more easily and preventing bacteria from finding places to hide in the future. Your dentist may also recommend taking antibiotics to help eliminate bacteria that is contributing to the disease. 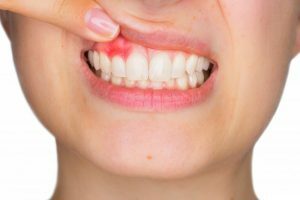 How Can I Keep My Gums Healthy and Prevent Disease? Brushing and flossing: Brush your teeth twice a day, for two minutes each session to clean out plaque before it can form into tartar. Also, floss once a day to clean plaque and debris from in between your teeth. Regular dental visits: See your dentist for regular checkups and cleanings. They will take a look at your gums to make sure they’re healthy and clean your mouth in places that your normal brushing and flossing won’t reach. Quit smoking: If you smoke or use tobacco products, quitting could be a real difference maker in your gum health. Smoking weakens your immune system making it harder to fight off infection, plus it makes it more difficult for your gums to heal once they’re damaged. Gum disease in Kaukauna can lead to much more serious health issues like tooth loss and a higher risk of stroke and heart disease. It progresses slowly, so catching it while it’s a small issue is best. Thanks to National Gum Care Month, you now know the signs of gum disease and how to keep your gums healthy, so you can keep your smile beautiful! Dr. Bob Heil and Dr. Heather Heil enjoy getting to know their patients to provide them the best care possible. Since gum disease is so common, they offer periodontal therapy in their office to treat the disease. They currently practice at Dental Expressions where they can be contacted through their website or by phone at (920) 788-6280 for any questions.